Our high school youth ministry program which is designed to lead teens closer to Christ. Our Youth Nights are held on the 1st and 3rd Sundays of the month, starting at 5:30 pm with a meal in the PLC, and conclude by 7 p.m. In addition to the Sunday night programs, a variety of events and activities are held throughout the year including a mission trip, sponsoring a Christmas Party for area foster children, a day at Cedar Point, Spaghetti Dinner, a Mother’s Day plant sale, and much more! The youth are the future of our church, but also the church of today! Come join us and have some fun! All are welcome! Includes trained youth ministers and adults (training provided) who plan the Youth Nights and lead the teens to be affirmed, educated and challenged to live the Gospel. The adults also assist the youth minister where needed in various youth events and activities throughout the year. This team meets two Wednesdays a month. Adult Support Team-Adults within the parish who provide food, beverages and/or materials needed for the youth nights and various activities. Young Adult Ministry is a fairly new idea in the Catholic Church and has only in recent years begun to take root in Dioceses and parishes. 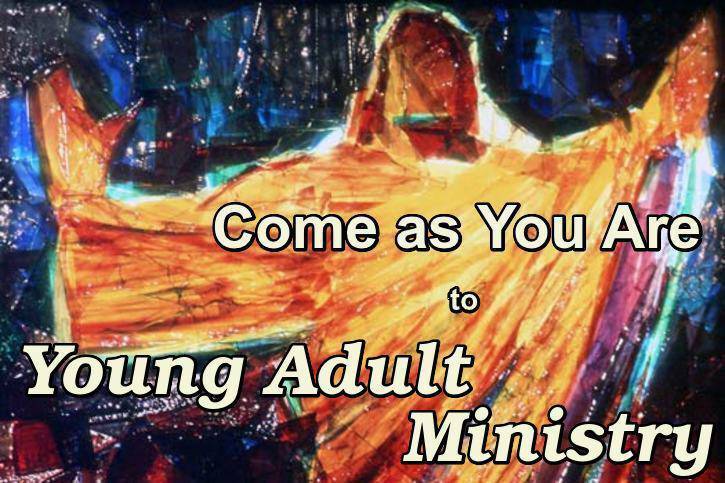 Young Adult Ministry is designed to help those between the ages 18 and 39 find fellowship within their church community. Through Young Adult Ministry we hope to give voice to the concerns of young adults in our parish, get young adults more involved and active in the on goings of parish life and ministry, and to create an environment that is friendly toward young adults who are questioning, exploring, and looking to learn more about their faith. We are very excited to begin this journey with the young adult community within our parish. A group of young adult volunteers who are committed to promoting and uplifting young adults in the parish. These young adults help plan, lead, and provide for various young adult and parish wide events. The Young Adult Core Team meets twice a month. Young Adults and Adults with in the parish who provide food, beverages, materials, and resources needed for various events and activities for Young Adult Ministry.